Or, at least, do not disturb the sachatamia’s (Sachatamia punctulata) habitat. That’s because this Colombian frog is picky about where it lays its eggs: only in gallery forest on leaves that overhang water. Once they hatch, the tadpoles drop from that perch into the water to finish growing up. This means that habitat loss and fragmentation, particularly due to agriculture, are an important threat to this frog. Currently, none of its habitat is protected. It is also vulnerable to small white flies that lay their eggs within sachatamia eggs. Photo by Victor Fabio Luna-Mora via Arkive. 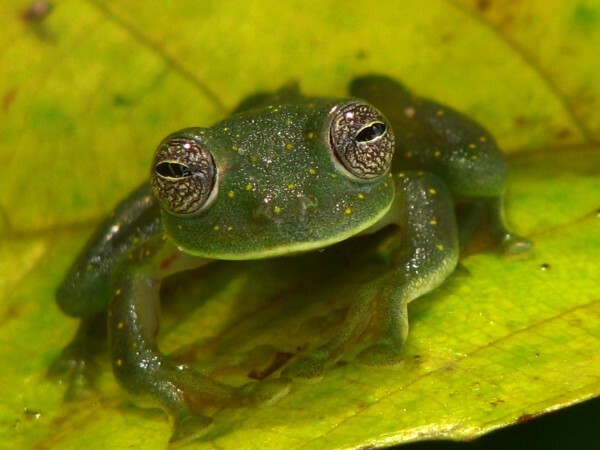 This entry was posted in biodiversity, Cute Frog of the Week, why frogs matter and tagged Cute Frog of the Week, Sachatamia, Sachatamia punctulata by Lindsay. Bookmark the permalink.